New observations from NASA's Phoenix Mars Lander provide the most magnified view ever seen of Martian sol, showing particles clumping together even at the smallest visible scale. In the past two days, two instruments on the lander deck -- a microscope and a bake-and-sniff analyzer -- have begun inspecting soil samples delivered by the scoop on Phoenix's Robotic Arm. "This is the first time since the Viking missions three decades ago that a sample is being studied inside an instrument on Mars," said Phoenix Principal Investigator Peter Smith of the University of Arizona, Tucson. Stickiness of the soil at the Phoenix site has presented challenges for delivering samples, but also presents scientific opportunities. "Understanding the soil is a major goal of this mission and the soil is a bit different than we expected," Smith said. "There could be real discoveries to come as we analyze this soil with our various instruments. We have just the right instruments for the job." Images from Phoenix's Optical Microscope show nearly 1,000 separate soil particles, down to sizes smaller than one-tenth the diameter of a human hair. At least four distinct minerals are seen. 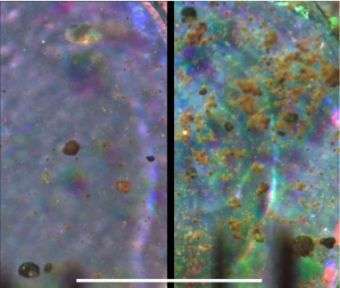 "It's been more than 11 years since we had the idea to send a microscope to Mars and I'm absolutely gobsmacked that we're now looking at the soil of Mars at a resolution that has never been seen before," said Tom Pike of Imperial College London. He is a Phoenix co-investigator working on the lander's Microscopy, Electrochemistry and Conductivity Analyzer. The sample includes some larger, black, glassy particles as well as smaller reddish ones. "We may be looking at a history of the soil," said Pike. "It appears that original particles of volcanic glass have weathered down to smaller particles with higher concentration of iron." The fine particles in the soil sample closely resemble particles of airborne dust examined earlier by the microscope. Atmospheric dust at the Phoenix site has remained about the same day-to-day so far, said Phoenix co-investigator and atmospheric scientist Nilton Renno of the University of Michigan, Ann Arbor. "We've seen no major dust clouds at the landing site during the mission so far," Renno said. "That's not a surprise because we landed when dust activity is at a minimum. But we expect to see big dust storms at the end of the mission. Some of us will be very excited to see some of those dust storms reach the lander." Studying dust on Mars helps scientists understand atmospheric dust on Earth, which is important because dust is a significant factor in global climate change. "We've learned there is well-mixed dust in the Martian atmosphere, much more mixed than on Earth, and that's a surprise," Renno said. Rather than particles settling into dust layers, strong turbulence mixes them uniformly from the surface to a few kilometers above the surface. Scientists spoke at a news briefing today at the University of Arizona, where new color views of the spacecraft's surroundings were shown. "We are taking a high-quality, 360-degree look at all of Mars that we can see from our landing site in color and stereo," said Mark Lemmon, Surface Stereo Imager lead from Texas A&M University, College Station. "These images are important to provide the context of where the lander is on the surface. The panorama also allows us to look beyond our workspace to see how the polygon structures connect with the rest of the area. We can identify interesting things beyond our reach and then use the camera's filters to investigate their properties from afar." i'm loving the high res images. >Studying dust on Mars helps scientists understand atmospheric dust on Earth, which is important because dust is a significant factor in global climate change.